Is your property Beach Front? 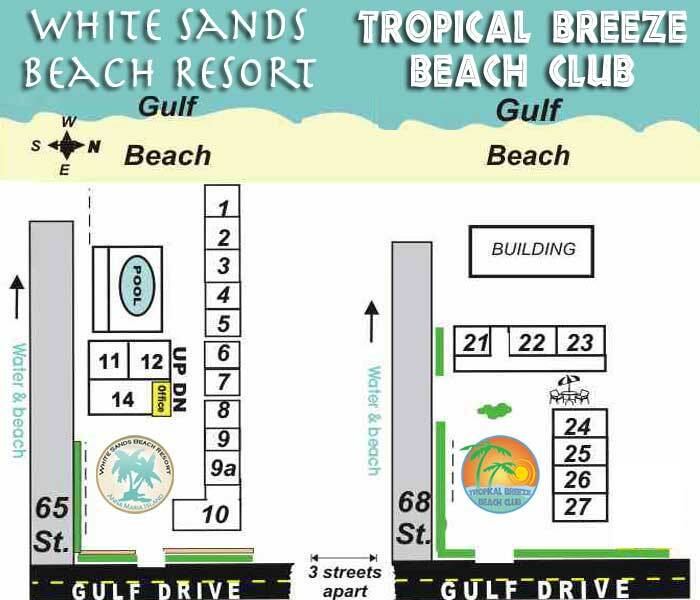 Yes and No, White Sands Beach Resort Is beachfront and Tropical Breeze Beach Club is beach side. Yes, All room are Air Conditioned. Yes, White Sands Beach Resort and Tropical Breeze Beach Club have a limited laundry facility open from 3:30 PM to 8 PM Monday thru Friday. Yes, We have free WIFI in room and around both of our properties, White Sands Beach Resort and Tropical Breeze Beach Club. Do your rooms have Kitchens? Yes, All Rooms have complete kitchens with stoves, microwaves, full size refrigerators, Toaster, 12 cup coffee maker, blender, pots and pans, complete dishes and silverware for 6 people. Even in our smallest rooms. We also supplies items such as coffee filters, dish towels and wash clothes, bathing towels, sheets, Toilet tissue, facial tissue, mop, and vacuum. Do you have Phones in room? Yes, All rooms have phones in rooms, local call are free and Long Distance must use a calling card. We do not add any additional charges. Yes the pool is located at White Sands Beach Resort and the Tropical Breeze guests are allowed to use it. Is your Pool heated in the winter? Yes, We heat our pool with both solar and gas, to keep it at 84 degrees. Do you have lending Library? Yes, free use of reading books, ask at the front desk. Do you have DVD Video and Play Station Games? Yes, both are FREE to checkout, ask at the front desk. 3 PM. We will let you in earlier if room is complete early. You are more than welcome to use the resort facilities such as pool and beach, while you wait for your room to be complete.